Having your tires balanced and aligned vehicle is important for the durability of the tire, to vehicle performance and safety of the occupants. It must balance the tires to prevent vibration and cause the driver fatigue. 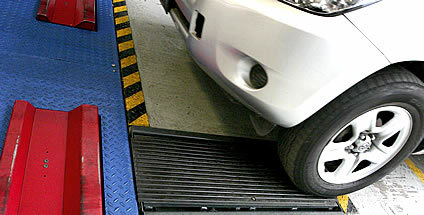 The alignment reduces tire wear, suspension and steering of the vehicle. Are you performing vibratioan while driving, if the car deviates long the wheel or unresponsive when entering the curve? If the answer is yes to these questions, then your vehicle has a problem and needs resolution. Must check the tires (tires), the steering and suspension systems to determine the cause and correct it to restore stability to your vehicle. If it does not solve the problem, cause excessive wear on the tires and suspension, and most critical is that will compromise your integrity and that of his companions. The alignment maintains vehicle stability and prolongs the life of your tires / tires. When the vehicle wheel alignment? When tires are replaced with new ones. When tires have uneven wear. When maintenance is performed on the steering system or suspension. When the vehicle is not going in a straight line if long the wheel. After a collision with another vehicle, a curb or pothole. When the vehicle shows signs of misalignment. After 20,000 km of having made the last alignment or 1 time a year. Wheels that work in parallel to each other and to roll at the correct angle. Each vehicle has its own angles. These angles depend on the weight of each of the front and rear wheels, design and strength of springs, coils or bars of torque and other factors. A laser computerized equipment determines the angles to be corrected by adjusting various points or rising wedges or shims to compensate for wear and damage caused by rough roads. The vehicle properly aligned will address your steering wheel straight and true, go through the same arc when you turn right or left, and cornering control display without roncear (while the velocity and acceleration are reasonable). It also provides longer life to the tires, CV joints, rack, bearings, spreaders, dies, bushings, dampers and other train traffic. A vehicle is aligned when all suspension components and address (set of rims and steering wheel) work correctly. Uneven wear of the tires, excessive wear showing an extreme band. Strange feeling in the steering. The steering feels harder than normal or the vehicle turns more easily to one side than the other. In a straight line the steering wheel is not in correct position, ie the vehicle is straight but the steering wheel is turned to the side. The vehicle is loaded to one side while driving. Appears a vibration at speed, but disappears when going slower or faster. The vehicle is out of square, ie the front wheels point in a direction and rear wheels in another. The vehicle shows oversteer or understeer. How does it manifest oversteer and understeer? Oversteering is a top rear axis deviation relative to the front axle. The car appears to turn over what has been asked. The strong grip tires and your vehicle tends to go a lot in the curve, skidding the rear tires on a major arc. Understeer is a turn up front axle with respect to the rear axle. The car wants to go straight while you have turned the wheels. The front tires lose traction, leaving a major arc and your vehicle tends to go out of the curve.